With Jesse up in Rhode Island this month, I am back to making meals for one. Since I am not a huge fan of leftovers or shopping for items I will only use a small portion of, cooking for one usually turns into microwaved meals or delivery. I am determined, however, that this time will be different. This month I will actually cook meals for me. 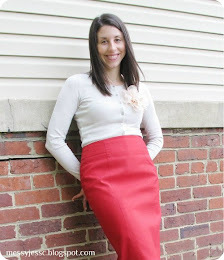 I figured I would start by making something super easy and quick, and something that incorporated some of my favorite items. What met all of these qualifications? 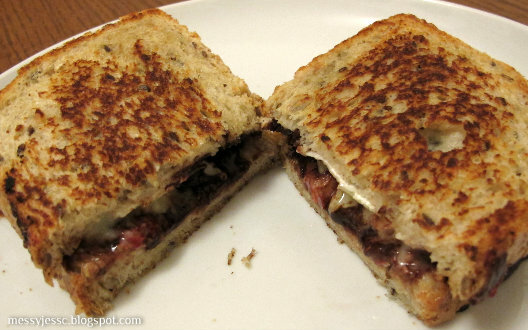 Roasted Strawberry, Brie and Chocolate Grilled Cheese, of course! The recipe posted on my What's Cookin' page includes portions for two sandwiches, but since I am flying solo, I cut the recipe in half. 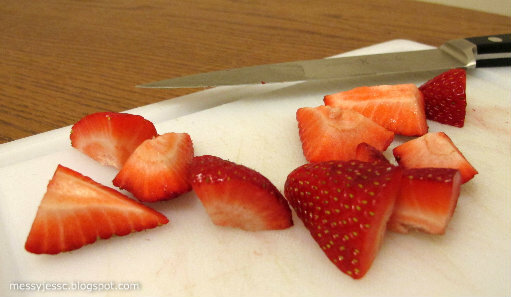 First I quartered my strawberries and tossed them in with a teaspoon of canola oil and a dash of salt. I placed them on a baking sheet and roasted them for 15-20 minutes. While the Strawberries were roasting, I prepared the rest of the sandwich. 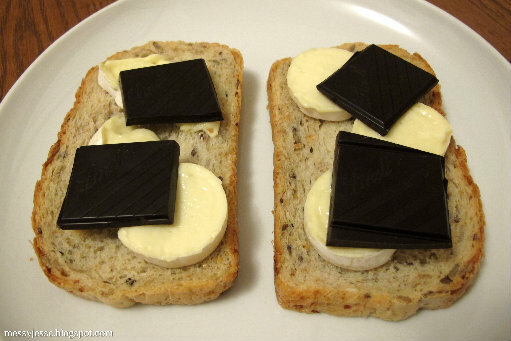 Buttering the outside of both pieces of bread and then layering my slices of brie and dark chocolate. 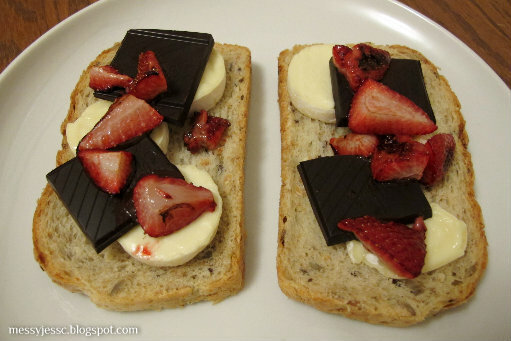 Once the strawberries were finished, I placed them on top of the layers of brie and chocolate. Then I put the two sides together and placed it in a skillet over medium heat for about two minutes on each side. If you want my honest opinion, the results were a bit disappointing, but I think it was due to variables that can actually be changed. First, I would buy higher quality brie. 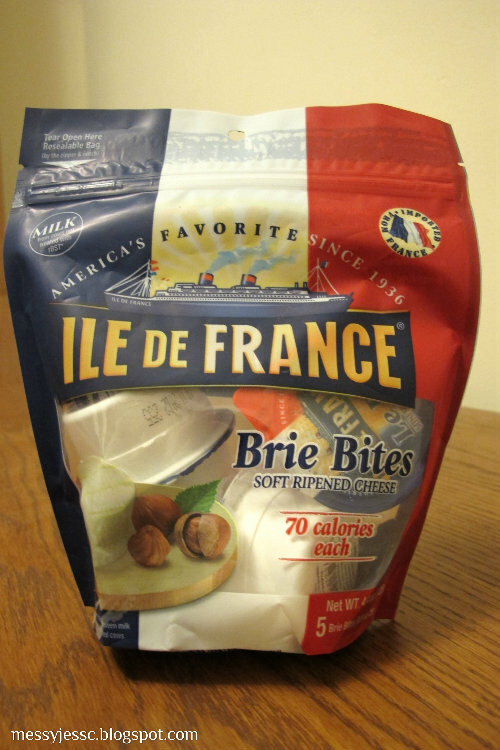 I was trying to make the process as easy as possible and without knowing much about brie, I purchased the brie bites below. They were easy, but not super tasty. Next time, I talk to a cheese expert and get a higher quality brie. I would also use better whole grain bread. Thankfully the bread held together, but the flavor just didn't go with the rest of the ingredients. Finally, I would eliminate the step of spreading butter on the bread and just lightly oil the frying pan. 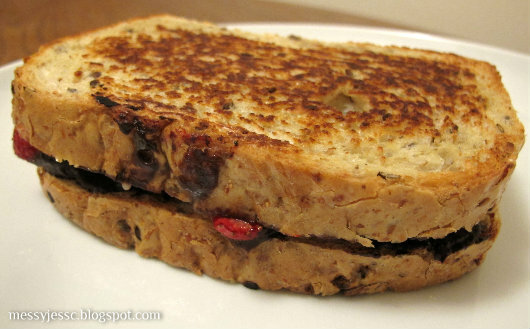 The sandwich has enough tasty flavors without butter. I would love to hear from you if you make this recipe what your recommendations are to make this tasty sandwich even tastier. To print out this and other delicious recipes, check out my What's Cookin' page. Chocolate on a sandwich? I'm in!